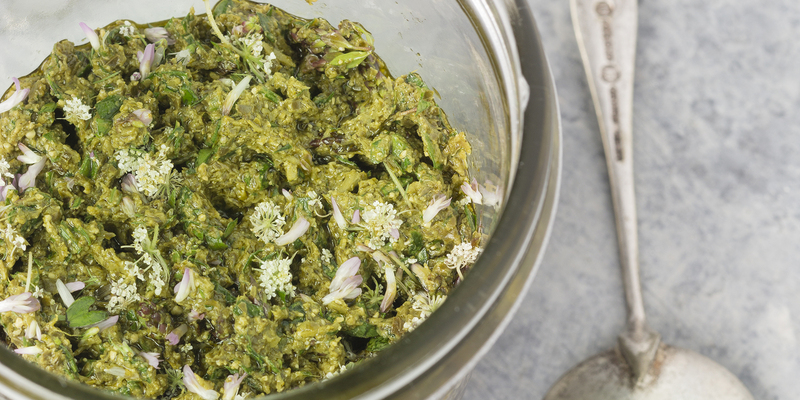 If you thought that making a traditional pesto was the quintessential act of the warm season, you may need to reconsider. Cutting off the flower heads for this recipe will help the plants refocus on more foliage production while there is still time. It’s the prelude to the harder cut-back of winter. Bringing together all the floral notes of these perennial (and some annual) herbs is not as complicated as it may appear at first glance; rather it’s a well-balanced herbaceous mix that will lighten up any plate of pasta or warm salad. It will also have you reminiscing about the greatness of summer. Roughly chop the walnuts and toast in a dry, hot frying pan over medium heat for 2–3 minutes, tossing constantly. Set aside to cool. Roughly chop the garlic and spring onions and add to a food processor with the remaining ingredients. Pulse the mixture to a coarse paste and serve immediately or store in an airtight container in the refrigerator for up to 1 week, or in the freezer for up to 4 months.